Don't waste time hunting for unorganized business cards; keep contact information easily accessible. Heavyweight polypropylene with a reinforced binding edge hold your important business cards for easy reference while at the office or on the road. 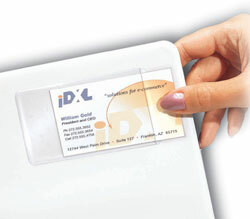 Pages include index tabs with inkjet/laser inserts to help you organize business cards. Free, downloadable templates. 5/PK.